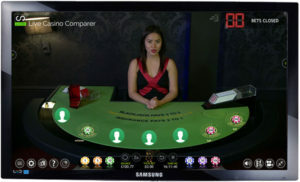 Extreme Live Gaming have been around for a couple of years and have created a really great live blackjack product. The game is more personal than you’ll find elsewhere and that has a lot to do with how they’ve positioned the dealers and camera in the studio. The dealer appears quite close to you so you get a more intimate feel. The dealing studio is relatively small, so not that noisy, although you can hear Roulette in the background and some of the other dealers talking. None of which is really distracting. Generally I find that the smaller live casino providers do offer a more intimate playing experience. I think that is largely down to the size of the studio. It feels less of a production line of tables and more like how it feels to be in a land based casino. Anyway you’re here to read about Extreme live blackjack so I’ll get on with it. Extreme Live Gaming offer 7 seat blackjack from a number of tables which increase as player numbers rise throughout the day. The game is dealt from an 8 deck manual shoe that’s changed about ¾ of the way through. 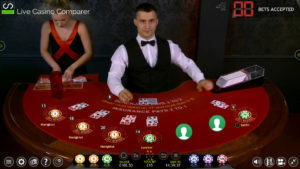 The cards are generally shuffled on a table behind the dealer and in plain sight of players. The game is played to Vegas rules (the dealer gets two cards). The dealer will offer insurance if his up card is an Ace and will then check for Blackjack. If it’s a Blackjack the game round ends. You can split a pair. Split Aces only get one card while other splits get as many as you want. You can double on any first two cards but not on a hand that has been split. 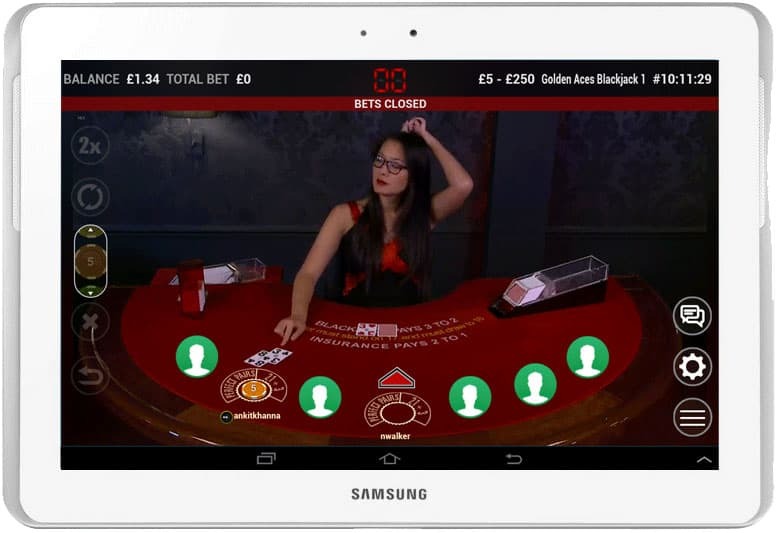 There are a range of side bets on offer and depending on the live casino you’re playing at they may or may not be available to you. Check out my Extreme Live Gaming page for details of who has what side bets. Extreme only have one studio and that is based in Brentford, West London. It’s actually on a floor in the Novomatic building, which is Extreme’s parent company. 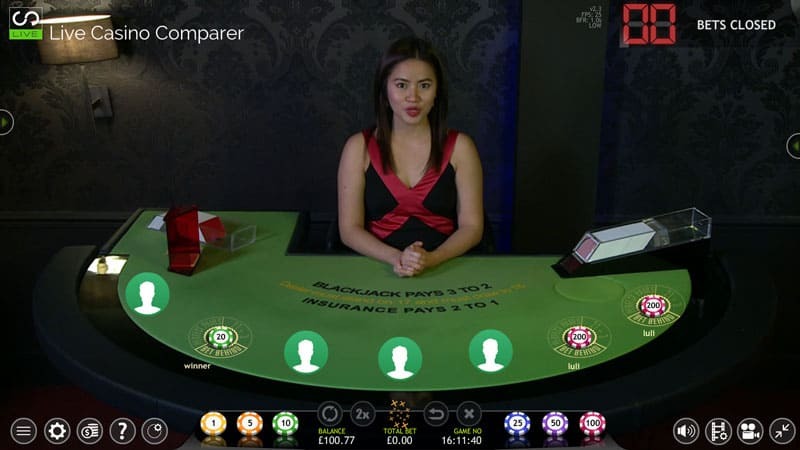 They have four coloured tables that they mix and match between VIP, Low stakes , higher stakes and International Languages. 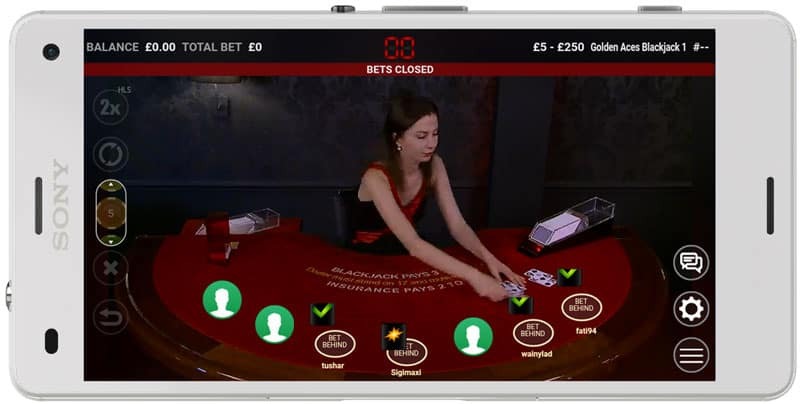 Extreme Live Blackjack can be played on PC, Mobile and Tablet. The screen on mobile is a bit small if I’m being honest and not somewhere I’d play for any length of time. Unusually it comes in two screen formats, landscape and portrait. A Tablet is better and the best is PC to play on. At first glance the playing interface looks much the same as others, but if you look closely you see that all of the interactions you need to do with the game are listed across the bottom of the screen. There are side panels that pop out (left and right of screen) if you click on the tabs. 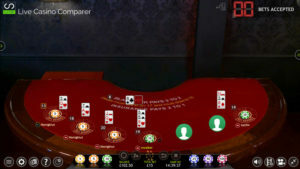 They display the Chat facility and Betting and Payout information. With Video where you see the dealer and the cards dealt. 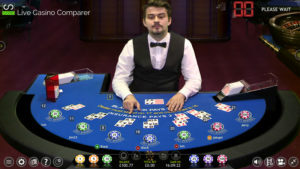 No video, only computer generated table and cards. Switch Table – which shows the lobby menu so you can pick a new table or another game. Language – Pick the language you want the screen to be displayed in. Player History – shows your previous hands and the outcomes. 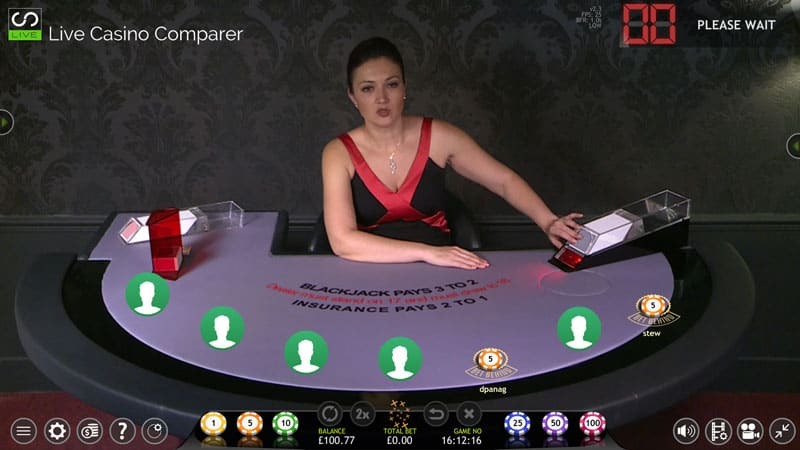 Bet Behind Settings – If you’re using the Bet Behind side bet you can choose whether to automatically Double, Split or take Insurance when the main player does. Cashier – Takes you to the cashier so you can deposit or withdraw. Help – Gives detailed info on how to play the game and the side bets. Also how to use the playing interface. Bet Behind – Allows you to access the Bet Behind setting directly. Audio – Switches sound on or off. Video Quality – Switches between low and high quality. Images are sharper and almost HD in quality on high. Video – Switch on to display the dealer interface. Switch off to see the computer generated images. Full Screen – Displays the playing interface in Full Screen mode. 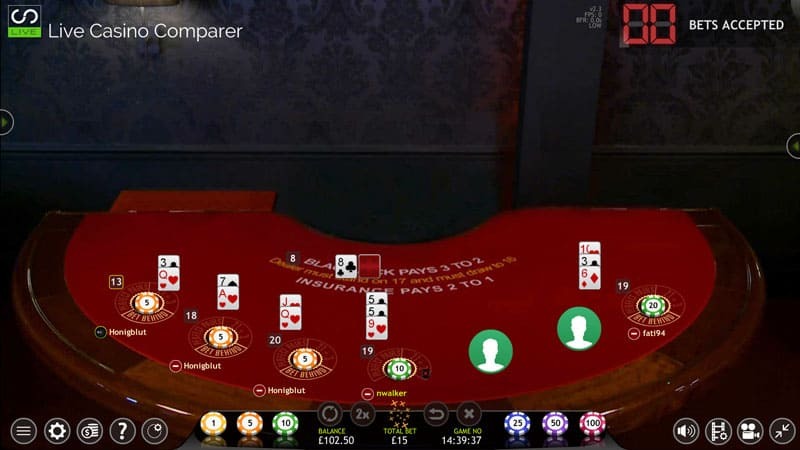 When you’re playing you’ll see a number of different options displayed depending on the cards you’ve been dealt or the side bets you’re playing. You cannot use the chat facility unless you have money in your account and are sitting at a table. 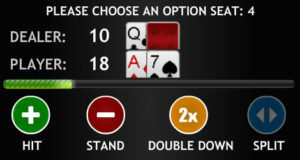 At betting time you’ll need to place a bet in front of you to play the main hand. For the first couple of hands you’ll have to confirm, but if you use the re-bet feature it does it for you. 21+3 – You bet that your first two cards and the dealers up card make a poker hand. The top payout is for suited trips at 100:1. Bet Behind – Where you can bet on another players hand. You have no ability to decide how to play the hand, but you can make adjustments in the settings as to what happens when he splits, doubles or insurance is offered. Make sure the player is using basic strategy before you sit behind them. Insurance – If the dealer is showing an Ace then you’ll be offered insurance, which is half your bet. If the dealer has a Blackjack you’ll be paid at 2:1. Pre-decision – If there is more than one person on the table you’ll see a little box appear under your cards when the initial deal has been completed. This allows you to pick the action you’re going to take before the dealer gets to you. It’s a good feature that speeds up play. Stand – Not to take another card. Double – you double your initial bet and take only one more card. Split – Spit a pair into two hands and play the as separate hands. My Blackjack strategy explains what decision to make dependent on the value of your two cards and what the dealer is showing. If you get disconnected during a game round your hand will stand, no more cards will be dealt. If you win, the money will be paid into your player account. A very similar live blackjack to the one from Evolution. The major omission is the Deal now button when you’re playing on your own. What I do like, and you don’t see this very often is the dealers will ask the pit boss to free up seats if they are taken and the player isn’t playing. Quite savvy really from a business perspective and it really helps if you’re waiting to play and can’t get a seat. I wish more of the live casinos I’ve reviewed would employ this practice.